Officers in Cleveland are not happy with recent decisions of Chief Calvin Williams (right). 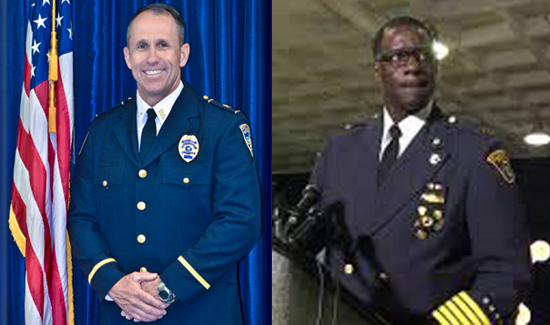 Baton Rouge Chief Carl Dabadie (left) supported his officers after a controversial OIS. I just posted this message on my Facebook page after learning that the Baton Rouge Police Chief, Carl Dabadie, refused to fire his officer after he was cleared in the Sterling shooting last year. What a difference from the situation here in Cleveland where Tim Loehmann, the officer who shot Tamir Rice, was fired for alleged omissions (not lies) on his employment application. Tim was cleared of any wrong doing by four independent law enforcement investigations as well as departmentally by the Critical Incident Review Committee which was set up by the Mayor. But they were determined to fire Tim so after two years of investigations that proved that the shooting was justified, they trumped up some application omissions to justify firing him. There have been dozens of abnormalities in this investigation including the fact that Samiria Rice met privately with the chief in the end of January, 2017. We have emails that confirm that their plan was to fire Loehmann and Garmback was going to be suspended for 10 days. Frank Garmback’sg hearing was in the end of March, 2017 while Tim Loehmann’s hearing was mid May 2017. The hearings were ceremonious at best as the Chief had his mind made up to the point of notifying the Rice family of the end result months before either officer had a hearing! There was no due process, only politics. In Cleveland we dare to dream that someday we might have a chief with the integrity and moral fabric needed to do the right and just thing. Sterling’s death, while tragic, was the direct result of his terrible decisions that night and not the officers reactions to them. The same rings true here in Cleveland as Officers Loehmann and Garmback reacted appropriately to the situation that unfolded very quickly in front of them. When a 5’7″, 191 pound person pulls a gun out of his waistband on two uniformed officers responding to a gun run at an open recreation center, nothing good will or did happen. Unfortunately our chief does not have the same strength of character as the Chief in Baton Rouge. Graham vs. Conner IS NOT an optional “guideline”, it is the law of the land! Firing officers that did their jobs by following the rules, laws and training they received is an act of a coward, not a leader. Well done to the Chief of Baton Rouge for having the strength of character to stand with his officers when they acted appropriately and not allowing politicians, media and activists to attack and vilify the men in his charge who did the job they have been hired, trained, and asked to do.